American watch manufacturers Hamilton have been making ground breaking watches since 1892. Leaders in style and design, this sleek stainless steel bracelet watch is set with a distinctive yet simple black dial. Powered by automatic movement with date function, this Hamilton combines premium function and design. 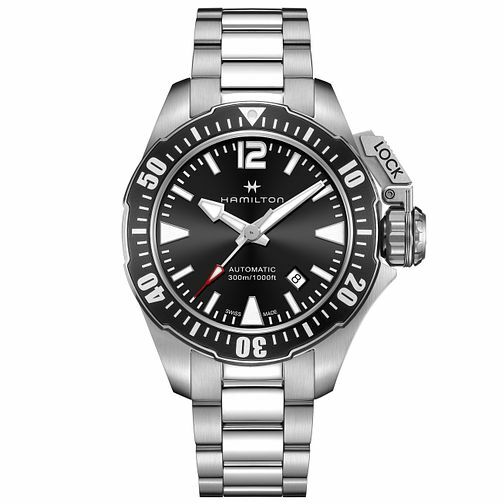 Hamilton Frogman Men's Stainless Steel Bracelet Watch is rated 5.0 out of 5 by 2. Rated 5 out of 5 by Anonymous from Fantastic pictures don't do it justice I have had the watch for two weeks and used it daily. Over this time it has only lost 2 seconds. I have a breitling and a few other much more expensive watches that don't come close to this. The H10 movement is great, it's not the same as the powermatic movement, and does not share the same plastic parts. If you want a diver with great accuracy i would highly recommend this watch. Ordering through earnest Jones is very easy, watch came well packaged and delivered on time. Rated 5 out of 5 by Anonymous from Excellent purchase Well made divers watch which is easy to read and is quite weighty also. Doesn't wear as big as I thought on my 7 inch wrist. Would definitely recommend.